FIBER ARTS GROUPS: KNITTING, CROCHET, WEAVING, ETC. Call before you go, to be sure these groups are still active! JOIN "Philly Knits" free MEETUP GROUP where we post the places and events we meet at! Below are additional groups who do not want to be posted on meetup, but appreciate the additional publicity this Philly Knits webpage offers. http://www.pghw.org/ The Philadelphia Guild of Handweavers is a non-profit organization whose mission is to foster the art and craft of weaving and the fiber arts. Meetings: The second Monday of each month at 7:00 P.M. The Philadelphia Guild of Handweavers and Fiber Artists http://www.pghw.org/ 3705 Main Street Philadelphia PA 19127, pghwinfo@gmail.com, 215-487-9690 / The Guild has a portable fibers group every Tuesday at the Guild House. We get together from 10am to 12 noon and those attending bring whatever project they can carry in. We have weaving, dyeing, spinning, knitting, crocheting, embroidery and any fiber work you can think of and is portable. We have a wonderful library and a Kuerig to boot. There is no agenda and it is a lot of fun. You do not need to be a member to come and there is plenty of free parking across the street. This coming Tuesday, the group will not meet due to our annual Celebration of Fibers. Yarnspinners of Saint Katherine of Siena Parish http://www.stkatherineofsiena.org/yarnspinners-of-saint-katherine-of-siena-parish.html The Yarnspinners group meets every Tuesday from 9:45 a.m. to 11:45 a.m. in the large conference room in McBride Hall to make items for charitable and/or personal use. Members at any skill level are welcome. About us: BusyFingers is a group of Crocheters who love the Art. Meetings: We meet every fourth Saturday of the Month from 1pm to 4pm, except holiday weekends then we meet on the third Saturday. For New Learners all we ask is that you bring 4ply light colored yarn and G, H, or I Hooks to use and any projects you may be working on and your Love and interest in CROCHET! We teach the basic stitches in crochet. No one under 13 please. And for those of you who know how to Crochet we would like for you to share your skills, and your love of crochet! Every meeting we have a Show N Tell and a review of any new books and patterns you would like to share with the group. We also have a Yarn Exchange twice a year and after attending 6 meetings you will recieve a free gift! We will help you with any crochet patterns! We make / need: Our Group is also involved in creating scarfs and hats in the winter for local charities. MEETINGS: Generally, they meet the 4th Saturday of the month from 1-4 pm, but please check.// Join Sisters Interacting Through Stitches as they create items which are donated to local, national, and international organizations. 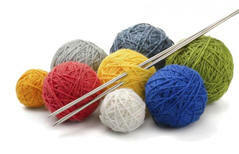 In addition, club members are willing to teach the art of crocheting and knitting to interested adults and teens. From 1-4 pm we knit/crochet. Before that, from 11 am -1 pm the Library will feature a special speaker. You can come for both!